The single largest variable cost factor in making a separation by evaporation is the cost of energy. If crude oil is the ultimate source of energy, the cost of over $126.67 per m3 ($20 per barrel) is equivalent to more than $3.33 for 1 million kJ. Water has a latent heat of 480 kJ/kg at 760 mm of mercury, absolute, so the energy required to evaporate 1 kg of water exceeds 0.16 cents. Therefore, the efficient utilization of energy is the most important consideration in evaluating which type of evaporation system should be selected. Energy can never be used up; the first law of thermodynamics guarantees its conservation. When normally speaking of "energy use" what is really meant is the lowering of the level at which energy is available. Energy has a value that falls sharply with level. Accounting systems need to recognize this fact in order to properly allocate the use of energy level. The best way to conserve energy is not to "use" it in the first place. Of course, this is the goal of every process engineer when he evaluates a process, but once the best system, from an energy point of view, has been selected, the necessary energy should be used to the best advantage. The most efficient use of heat is by the transfer of heat through a heat exchanger with process-oriented heat utilization, or by the generation of steam at sufficient levels to permit it to be used in the process plant directly as heat. When heat is available only at levels too low to permit recovery in the process directly, thermal engine cycles may be used for energy recovery. Heat pumps may also be used to "pump" energy from a lower to a higher level, enabling "waste" heat to be recovered through process utilization. Thermal efficiencies of heat exchangers are high, 90-95%. Thermal efficiencies of thermal engine cycles are low, 10-20%. Heat pumps permit external energy input to be reduced by a factor of 4 to 5; however, the energy required in a heat pump is in the work form, the most expensive energy form. Utility consumption, of course, is one of the major factors which determine operating cost and, hence, the cost of producing the product for which a plant has been designed. In order to select the proper equipment for a specific application it is important to be able to evaluate different alternatives, which may result in a reduction of utility usage or enable the use of a less costly utility. For example, the choice of an air-cooled condenser versus a water-cooled condenser can be made only after evaluating both equipment costs and the costs of cooling water and horsepower. When heating with steam, a selection of the proper steam pressure level must be made when designing the evaporator. No definite rules for the selection can be established because of changing plant steam balances and availability. However, it is generally more economical to select the lowest available steam pressure level which offers a saturation temperature above the process temperature required. Some evaporator types require relatively low temperature differences. Some products may require low temperature in order to reduce fouling or product degradation. Maximum outlet temperatures for cooling water usually are dictated by the chemistry of the cooling water. Most cooling water contains chlorides and carbonates; consequently temperatures at the heat transfer surfaces must not exceed certain values in order to minimize formation of deposits or scale, which reduces heat transfer and leads to excessive corrosion. In addition, velocity restrictions must be imposed and observed to prevent corrosion and fouling as a result of sedimentation and poor venting. Stagnant conditions on the water side must always be avoided. In some plants, water consumption is dictated by thermal pollution restrictions. Unnecessary restraints should not be imposed on the pressure drops permitted across the water side of condensers. All too often, specified design values for pressure drop are too low and much higher values are realized when the unit has been installed and is operating. Not only does this result in more expensive equipment, but frequently the water flow rate is not monitored and cooling water consumption is excessive, increasing operating costs. Because cooling water consumption is governed by factors other than energy conservation and because cooling water velocities must be maintained above certain values, tempered water systems can be effectively used at locations where cooling water temperatures vary with the season of the year. At some locations a 30°C difference between summer and winter water temperatures is experienced. At such locations a tempered water system may be used in order to reduce both pumping costs and maintenance costs. A tempered water system requires a pump to recycle part of the heated cooling water in order to maintain a constant inlet water temperature. Evaporative-cooled condensers in many applications give greater heat transfer than air-cooled or water-cooled condensers. The evaporative equipment can do this by offering a lower temperature sink. 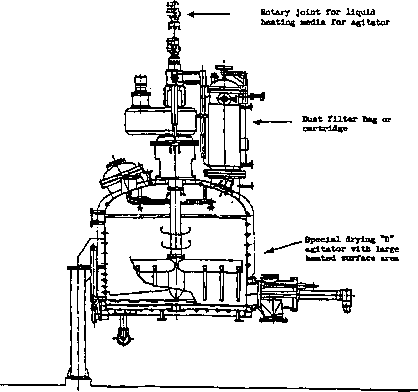 Evaporative-cooled condensers are frequently called wet-surface air-coolers. Perhaps the best description for this type of equipment is a combination shell-and-tube exchanger and cooling tower built into a single package. The tube surfaces are cooled by evaporation of water into air. Air-cooled condensers are especially attractive at locations where water is scarce or expensive to treat. Even when water is plentiful, air coolers are frequently the more economical alternative. Elimination of the problems associated with the water side of water-cooled equipment, such as fouling, stress-corrosion cracking, and water leaks into the process, is an important advantage of air-cooled equipment. In many cases, carbon steel tubes can be employed in air-cooled condensers when more expensive alloy tubes would otherwise have been necessary. The use of air-cooled heat exchangers may eliminate the need for additional investment in plant cooling water facilities. Maintenance costs for air-cooled equipment are about 25% of the maintenance costs for water-cooled equipment. Power requirements for air-coolers can vary throughout the day and the year if the amount of air pumped is controlled. Water rates can be varied to a lesser degree because daily water temperatures are more constant and because water velocities must be kept high to reduce maintenance. The initial investment for an air-cooled condenser is generally higher than that for a water-cooled unit. However, operating costs and maintenance costs are usually considerably less. These factors must be considered when selecting water or air as the cooling medium. Air-cooled condensers employ axial-flow fans to force or induce a flow of ambient air across a bank of externally finned tubes. Finned tubes are used because air is a poor heat transfer fluid. The extended surface enables air to be used economically. Several types of finned-tube construction are available. The most common types are extruded bimetallic finned tubes and fluted tension-wound finned tubes. The most common fin material is aluminum. Air-cooled heat exchangers generally require more space than other types. However, they can be located in areas that otherwise would not be used (e.g., on top of pipe racks). 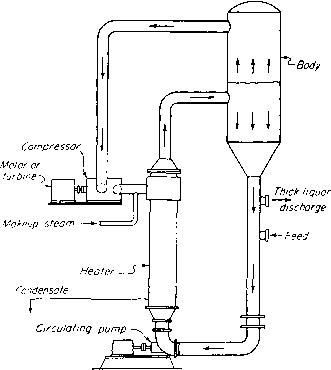 A forced draft unit has a fan below the tube bundle which pushes air across the finned tubes. An induced draft unit has a fan above the tube bundle which pulls air across the finned tubes. Air-cooled condensers are normally controlled by using controllable-pitch fans. Good air distribution is achieved if at least 40% of the face area of the bundle is covered with fans. It is most economical to arrange the bundles and select the fan diameters to minimize the number of fans. Controllable-pitch fans permit only the air flow required for heat transfer to be pumped. An important added advantage is the reduction of the power required for operation when ambient air temperature is lower than that used for design. Controllable-pitch fans can result in a 50% reduction in the annual power consumption over fixed-blade fans. There are many ways to waste energy in pumping systems. As energy costs have continued to climb, it has often been found that a complete pumping unit's initial investment can be less than the equivalent investment value of one electrical horsepower. Calandria circulating pumps require a certain available NPSH. This is usually obtained by elevating the evaporator, often with a skirt. Quite often the designer establishes the skirt height before he selects the calandria recirculating pump. In the interest of economy he provides a skirt as short as possible, often without realizing that he will be forever paying an energy penalty for a smaller initial capital savings. More efficient pumps often require greater NPSH. Therefore, it is prudent to check the NPSH requirements of pumping applications before establishing skirt heights of evaporator systems. Heat pumps or refrigeration cycles involves the use of external power to "pump" heat from a lower temperature to a higher temperature. The working fluid may be a refrigerant or a process fluid. Heat pumps use energy that often would otherwise be thrown away in the form of waste heat in effluents or stack gases. The external energy input can be reduced by a factor of 4 to 5, depending on the temperature difference and temperature level of the heat pump system. There are several ways to increase the steam economy, or to get more evaporation with less steam input, for certain types of evaporation applications. The use of multiple-effect configurations or compression evaporation can be considered for large flow rates of relatively dilute aqueous solutions. Both multiple-effect and compression evaporation systems require a sizable incremental capital investment over single-effect evaporators, and these systems are larger and more complex than the simpler one-stage evaporators. Like the multiple-effect evaporators described above, compression evaporation systems can only be justified by a reduced level of steam consumption. In a compression evaporation, a part or all of the evaporated vapor is compressed by a compressor to a higher pressure level and then condensed, usually in the heating element, thus providing a large fraction of the heat required for evaporation. Energy economy obtained by multiple-effect evaporation can sometimes be equalled in a single-effect compression evaporator. Compression can be achieved with mechanical compressors or with steam jet thermo-compressors. To achieve reasonable compressor costs and power requirements, compression evaporators must operate with fairly low temperature differences, usually from 5° to 10°C. This results in a large heat transfer surface, partially offsetting the potential energy economy. When a compression evaporator of any type is designed, the designer must provide adequate heat transfer surface and may decide to provide extra area over that required to anticipate reduced heat transfer should fouling occur. If there is inadequate surface to transfer heat available after compression, the design compression ratio will be exceeded causing a thermo-compressor to break or backfire or a mechanical compressor to exceed the horsepower provided. Mechanical compression evaporation (Figs. 19 and 20) is generally limited to a single effect. All of the vapor is compressed and condensed, eliminating the cooling water required for conventional or steam jet thermocompression evaporators; an advantage when cooling water is costly. Mechanical compression is ideally suited for locations where power is relatively inexpensive and fuel is expensive. The greatest advantage of mechanical compression is the high energy economy. Compressors may be reciprocating, rotary positive displacement, centrifugal, or axial flow. Single stage positive displacement compressors appear to be better suited to compression evaporation because of lower cost and their characteristic fixed capacity, dependent only on speed or discharge pressures. They are, however, limited in developed compression ratios and material of construction. The compressor may be driven with a diesel unit, a steam turbine, a gas turbine or an electric motor. Selecting the compressor drive requires analysis of all factors present at a particular location. One disadvantage of mechanical compression is that most systems require a heat source to initiate evaporation during start-up. Because the vapor is frequently water, which has a low molecular weight and a high specific volume, compressors are usually quite large and costly. Compressors require high purity of the vapor to avoid buildup on the blades of solids that result from evaporation of liquid as the vapor is superheated by compression. Liquids having high boilingpoint elevations are not usually adaptable to compression evaporation. Mechanical compression evaporation sometimes requires more heat than is available from the compressed vapor, so the evaporation rate can be controlled by regulating the makeup steam flow to maintain a constant liquor temperature. Usually, mechanical compression results in slightly higher maintenance costs because of the compressor and its drive. Mechanical compression is best suited for atmospheric or pressure operation, for mildly corrosive vapors, for low boiling-point elevation liquids, low temperature differences across the calandria, and where energy economy is important. Which alchohol will transfer the most heat energy per kg for a backpacker to use when cooling? Which alcohol will transfer the most heat energy per kilogram investigations? Which alcohol will transfer the most heat energy per kg for a backpacker to use for cooking? How is evaporation transfers energy to the air?